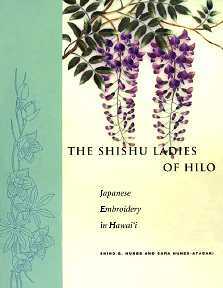 The Shishu ladies of Hilo : Japanese embroidery in Hawaii / Shiho S. Nunes & Sara Nunes-Atabaki. - Honolulu : University of Hawai'i press, 1999. - XIV-141 p. : ill. ; 28 cm. DESCRIPTION : In the 1930s Ima Shinoda began teaching groups of predominantly nisei women in and around Hilo the centuries-old art of japanese embroidery known as shishu. The Shishu ladies of Hilo is in part a loving tribute to Ima and Yoshio Shinoda, written by their daughter, Shiho Shinoda Nunes, and granddaughter Sara Nunes-Atabaki. But what began as a family history and catalog of Yoshio Shinoda's shishu designs evolved into a carefully documented and illustrated account of the stitching community created by the Shinodas and their pupils on the Big Island from the mid 1930s to the late 1960s. This book traces the teaching of shishu in Hawai'i and describes in detail the modifications made to traditional motifs and materials. It is, however, much more than a historical record of a textile art form. It raises questions about the relationship between these women, their ethnicity, and their needlework — in short, the role of art in achieving ethnic identity. From interviews with dozen of former students and other teachers of shishu, the authors collected stories of childhood, friendship, and family together with those of learning and creating shishu. Women generously shared their knowledge and memories as well as their art, taking decorative pieces from their walls, cushions and runners from their furniture, aloha shirts and mu'umumu'us from their closets. In The Shishu ladies of Hilo we are given a rare glimpse of ordinary people making everyday domestic textiles that imbue their daily lives with the richness of their cultural past. As Sara Nunes-Atabaki writes : « All these threads, and more, we have gathered and woven into the fabric of our book. I see the work of my grandparents and the women making colorful patterns against the strong holding threads of tradition, and this book as a way of preserving their stories and celebrating their achievement with needle, thread, and cloth ».